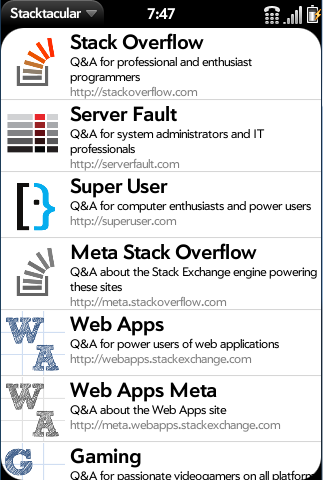 Stacktacular is a Stack Exchange client for WebOS. I created it mainly to scratch my own itch: viewing Stack Overflow using the phone browser was a bit painful, and no one had built a client for WebOS (that I could find). 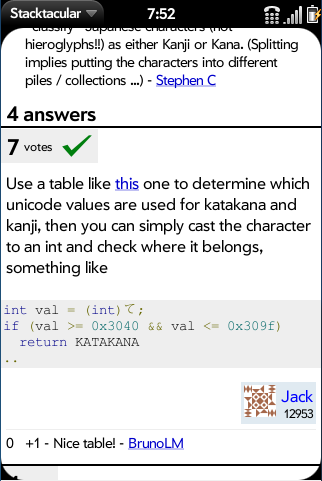 The application is currently in beta, but it is pretty usable as far as viewing questions, answers and comments for the various Stack Exchange sites is concerned. I still plan to add a bunch of features regarding user management and watching. Still determining this... probably will end up with the MIT license. The application source isn't public yet, but the application will be available for free on the Palm App Catalog. Opening http://developer.palm.com/appredirect/?packageid=com.taylormarshall.stacktacular will take you directly to the App Catalog install page if viewed from a WebOS device, or will give you an option to "send to phone" if viewed in a regular browser. WebOS, which is the operating system used on the Palm Pre / Palm Pixi smartphones. Note this has only been tested on WebOS 1.4 (Original Pre/Pixi). It may work on WebOS 2/3, but I haven't been working on any WebOS applications in about a year, so I haven't tested it there. This application was created by me (Taylor Marshall). I'm interested in any feedback that people may have, thanks. It's great to finally see a WebOS Stack Exchange client! Add a "tagged questions" view. 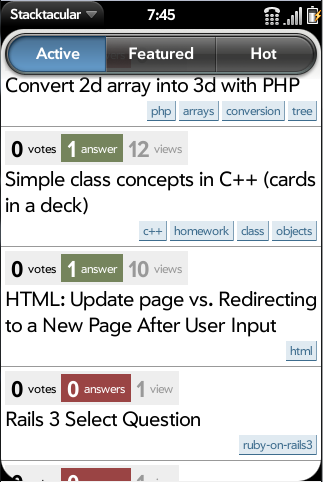 For example, one should be able to see only questions tagged "C++" on Stack Overflow at https://stackoverflow.com/questions/tagged/c%2b%2b. Not the answer you're looking for? Browse other questions tagged app webos .